Red Mill House in Daintree - recognised internationally as high quality birdwatching accommodation in Daintree, Queensland's Wet Tropics region of Australia - arguably, the countries finest birding area . Hosts Andrew and Trish Forsyth are keen Daintree birders with a wealth of local knowledge on birds, their sightings and the World Heritage listed Daintree Rainforest. Following the crash of the one existing computer in this house which supported Windows XP, we no longer have access to the Dreamweaver programme from which the Daintree Birdwatching Bulletin was created and maintained. 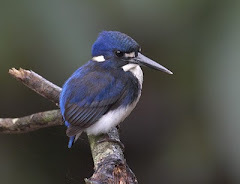 So - - - this blog is now the new Daintree Birdwatching Bulletin, which means I have to be a bit more vigilant about keeping it updated! September is a fabulous time of year in Daintree - warm, sunny, not humid and very few mosquitoes. With a couple of notable exceptions (Buff-breasted Paradise Kingfisher and Black Bittern), all our summer migrants are here. Lots of nesting is going on making some birds like Great-billed Heron and Southern Cassowary more difficult to see, and others like Metallic Starling and Brown-backed Honeyeater are easier. Good sightings of Little Kingfisher, Double-eyed Fig-Parrot and Pacific Baza in the garden at Red Mill House while Stewart Creek Rd has been handy for Lovely Fairy-Wren and Pied Monarch. Very good sightings of Noisy Pitta on the track at the end of Cape Kimberly and there has been a very handsome, and somewhat 'friendly' sub-adult Southern Cassowary at Jindalba Boardwalk, as the following photos from Paul McLelland shows us. Sub-adult Cassowary Jindalba Boardwalk - a close look! A male Cassowary with three chicks is also in the region of Jindalba, and also a large female. 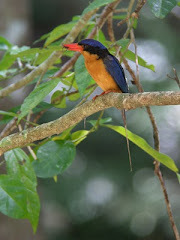 Most sightings seem have been early morning and it is has been difficult finding then during the day. Red Mill House in Daintree - Home away from Home for birders (and non-birders) visiting Daintree.